Each day we learn something more about this motor home. Yesterday morning when we were ready to leave Branson, I plugged the back-up camera back into the lower cigarette lighter, and the light didn’t come on. We checked different things, to no avail, but found that it would work when plugged into the dash portal. So we left it there and took off. The morning was foggy, visibility poor in some spots. We were barely onto the highway when a beeping started, coming from the back. After checking the CO2 detectors and pump and furnace switches, I finally determined that it was a fridge warning, but I couldn’t find the cause. Jim took the next exit off the highway in search of a place to stop. Five miles down the road we found a church with a large parking lot. By now all gauge lights and the fridge were no longer working. After fiddling with switches, Jim finally discovered that a button to disconnect the house battery had been switched off the night before, when he was trying to get the stabilizer jacks down. Turning that back on fixed the problem, but he still hasn’t been able to get the jacks to work. We heard on the news the night before that a nasty winter storm was a couple of days behind us, so the only stop we made yesterday, other than for stretching our legs, was at the Lambert Cafe in Ozark, Missouri, advertised on billboards as the “Home of the Throwed Roll.” We had to check that out! It was only 11:30 and already the parking lot was half full. We pulled into a bus parking spot – yes they come by the bus load. We were seated in a wooden booth in a room where the walls were covered with old tin advertising signs and licence plates. Helium Balloons floated from the backs of the seats. We ordered coffee to start and before we could look at the menu, we heard a cry, “Hot buns! Hot buns!” We looked up to see a young man tossing dinner rolls to patrons who gave a nod or held up their hands. With a nod, we soon had one of those fresh-from-the-oven buns in our hands. We tore pieces of paper towel from the roll on the table to use for plates. Another fellow came by with a can of molasses and a spoon. When our coffee arrived and we gasped! 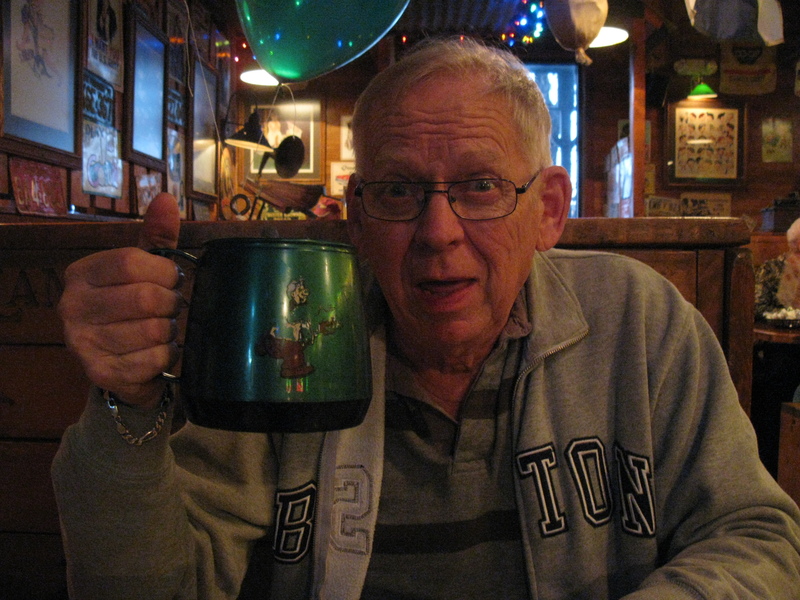 The mug was the size of a coffee maker carafe. Now that’s a LARGE coffee, the only size offered! 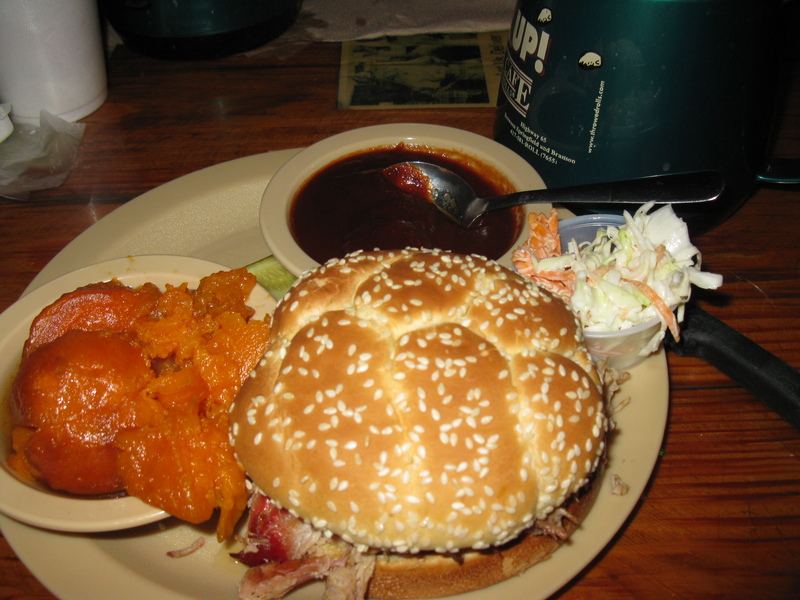 We ordered our lunch of pulled pork on a bun with candied yams and coleslaw, which would certainly satisfy us, but there was also a list of free sides that were delivered from pots to each table – deep fried okra, black-eyed peas, fried potatoes, tomato macaroni, and more. We tried some okra, and Jim tried some black-eyed peas. Everything was delicious, but far more than I could finish. The fellow across from us had a medium chief’s salad that was piled six inches high in a big bread bowl! A lunch menu it wasn’t! An interesting break in the day it was. We continued on to Oklahoma City, where stopped for the night in Rockwell RV park. Today we motored on, hoping to avoid the storm. Tonight we have stopped in Santa Rosa New Mexico, where the winds are already rocking us to sleep. The prediction for snow is light and low, but the temperatures are to drop before freezing, which worries us because we filled up our water tank and lines a few days back, when the weather was summer-like. We’re also having trouble with the furnace, which suddenly refuses to shut off unless the power is turned off! We won’t be cold, unless we run out of propane. This entry was posted in Community, Food, Photography, RV Travel, Travel and tagged Food, Lambert's Cafe, Missouri, Ozark, Photography, RV Travel, travel. Bookmark the permalink. Well, you said you were hoping for some interesting adventures, and it appears that you’ve found them–and then some. Thanks for taking us along for the ride.